2-Day Johnny Rainbolt Estate Auction — Harritt Group, Inc. Spacious 1900’s storefront home in the heart of Palmyra on Hwy. 150, the home of Johnny Rainbolt, lifelong resident and entrepreneur working in the carnival business. Also selling his eclectic lifetime collection including vintage Thunderbird, local memorabilia, bar, bar back, furniture, stained glass, quilts, stoneware, outdoor statues, antiques & country store items. 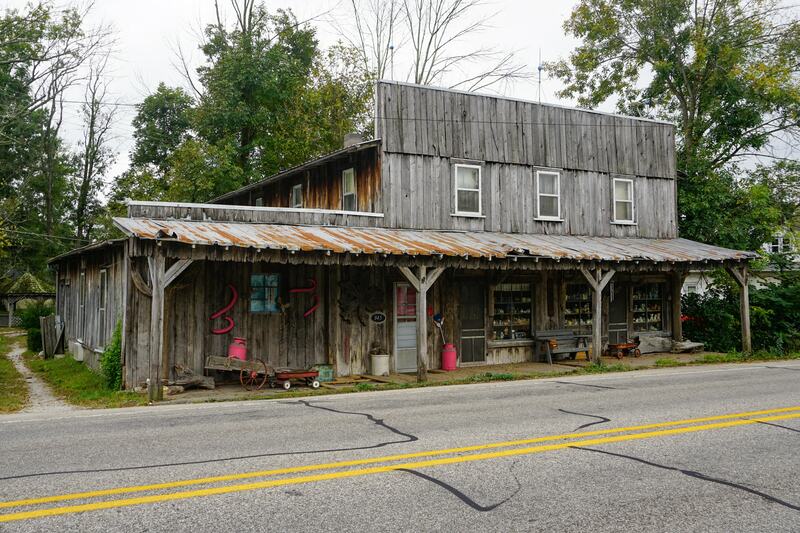 Circa 1900’s two-story 3652 square foot barn-sided storefront home with covered porch currently zoned R-2 located in the heart of Palmyra 15 miles West of I-64 on Hwy. 150 in commercial corridor. First floor includes two showrooms with wood floors & private entrances, family room, living room, eat-in kitchen, 1/2 bath and storage utility room plus 4 bedrooms, large walk-in closet, full bath, den and office upstairs. Property includes forced air electric heat plus (3) thru-the-wall heating & air units, metal roof, circular drive, gazebo and outdoor storm shelter on .25 acre lot. By appointment, call 812-944-0217 for showing. 10% non-refundable down payment due day of auction, balance due in 40 days. Real Estate taxes prorated to day of closing. Possession immediate at closing. Selling as is with no contingencies, all inspections welcomed prior to auction. 1962 Ford Thunderbird in as-found condition with title. 39” W x 10’H leaded glass cathedral church window in wood frame marked “In Memoriam to Minerva Anderson”, (2) colorful 24”W x 48”H arched leaded glass windows & (6) 15”W x 40”H leaded glass panels. 1800’s 15’L x 39”H columned bar counter in original finish, 8’x8’ back bar store counter, 15’ back bar base cabinet w/8 doors & 4 drawers and iron bistro table. Victorian furniture includes 7’ cylinder roll top secretary desk w/bookcase top , 7’ pier mirror, marble top server w/mirror, dressers and fainting couch, oak furniture includes secretary bookcase, kitchen cupboard w/frost glass doors & zinc top, round kitchen table, dish safe, server, lamp tables and potty chair, spool bed, 1930’s sideboard, gold leaf ornate arm chairs & settee, mahogany writing desk, black enamel china cabinet & vanity, retro armchair, several gold painted dressers, round bed, stand tables, porcelain top table, sofa, iron table & 4 chairs, coffee tables, curio cabinet, painted cabinet bases & dish safe, iron soda fountain chairs, rattan chairs, decorated plant stands, (2) folk art twig stands, rockers, wicker fan back chairs and more. (6) handstitched quilts, (2) 1800’s blue & white jacquard woven coverlets – one dated 1822, selection of vintage men’s and women’s clothing, vintage children’s clothing & boots, hats, linens and more. Koken white porcelain barber chair, Watling 1915 white porcelain 1-cent 300lb lollipop scale, Clark ONT 5-drawer spool cabinet, Coca Cola soda jerk jacket & 2 handies, Kraft cardboard animal ads, concrete Indian, Dryfus, Wenning’s, Keener & Manus Lard tins, Tiger tobacco tin, Cobbs Creek Blended Whiskey thermometer, Mail Pouch Tobacco thermometer, Jacobi Sales thermometer, advertisement boxes, large selection of advertising tins, (2) wood barrels & Thomas registers. Victor Victrola Model VV-210 talking machine, Victorian pump organ, Regal & Kalamazoo guitars, (2) older guitars, ukulele, trombone, bugles, (2) wood table top radios, RCA Model 45 EY-3 record player & RCA Victor record player, victrola horn, tambourine & harmonica, Edison cylinder records & hundreds of L.P. & 45 records. Cast iron police motorcycle, cast tank, several cast iron & metal cars, 1800’s wood rocking horse, Belknap Flyer red wagon, Tom Thumb register, old baseball mitt, 1933 Teddy bear (tagged Johnny’s) stuffed monkeys, windup tricycle, croquet set, wind up toy cat, train, lead soldiers, large selection of dolls and related items,1966 Batman & Robin trash can plus more. Huber & Huber Trucking toy truck, Safe Driver patches & driver’s shirt, (2) oak telephones, Minnesota treadle sewing machine, Dazey 4-quart churn, Purity Maid milk bottles & crocks, Von Allman & other milk bottles, coin changer, canister jars, hickory baskets, school slate, stoneware jugs & crocks, Zimmerman art glass paperweights, cast iron cookware, tea kettle, pig bank, pitcher pump, bull terrier door stop, Enterprise lard press, mantel and sad irons, fluting iron, apple peeler, large selection of local memorabilia, thermometers, calendars, black & white photos, Rainbolt Palmyra, IND. carnival ads, carnival lead milk bottles, 1944 Churchill Downs program, cast resin ship masthead, (2) wrought iron wall lamps, bird cage, large swirl marble and others, lanterns, wood plates, tea leaf china, Roseville & Van Briggle pottery, depression & pressed glass, china, chef menu board, chalk string holder, ornate gold gilded vases & figurines, oriental fans & decor, decorative boxes, old whiskey bottles, Ball jars, cream separator, match safes, vintage ink pens & pencils, graniteware, retro art glass vases & glassware, nut choppers, clown cookie jar, kitchenware, razors & shaving mugs, old spectacles, costume jewelry, postcards, pocket knives, yellow wood bucket, coffee grinder, butter mold, vintage santa & Christmas ornaments, washboards, books & magazines, Egyptian bust, swag lamps, oil & electric lamps, large selection of ornate frames, large parrot oil painting, prints, yard long lady prints, easels, (15+) concrete statues, concrete planters, bird bath & cherub fountain, cactus wood, child’s pull cart, wood cart w/iron wheels, and hundreds more of collectible items. I-64 to Greenville Hwy. 150 Exit #119. West 15 miles to auction on left.